In 1929, a peasant in Sichuan province, on the western borders of China's traditional territory, uncovered jade and stone artefacts whilst repairing a sewage ditch. This was a site that was located about forty kilometres (twenty-four miles) from Chengdu, but following these initial, accidental finds it was largely forgotten for second time. The significance of the jade and stone was not understood until 1986, when archaeologists unearthed two pits of Bronze Age treasures that included jades, about a hundred elephant tusks, and stunning, giant bronze sculptures 2.4 metres-high (eight feet) that suggest an impressive technical ability, one that was present nowhere else in the world at the time at which they were made. The treasures, which had been broken and buried as if they had been sacrificed, came from a lost ancient Chinese civilisation, now known as the Sanxingdui. The people of this civilisation had previously been lost to history. They lived in a walled city on the banks of the Minjiang River, but had not developed writing, although it was already in use by the Zhou dynasty to the east, four hundred kilometres (250 miles) away. The development of a culture this far west in China was something of a surprise. It was also a challenge to the accepted narrative of Chinese culture and development happening almost solely along the Yellow River. A new model of Chinese cultural emergence has had to be developed which sees several centres of innovation appearing, many of which contributed either directly or indirectly to China's development. That achieved, much greater freedom has been gained to examine sites of interest far and wide across China. Archaeologists now believe that the culture deliberately dismantled itself at a point in time between 1000 BC and 800 BC. Explanations for why it disappeared involved war and flood, but neither were very convincing. 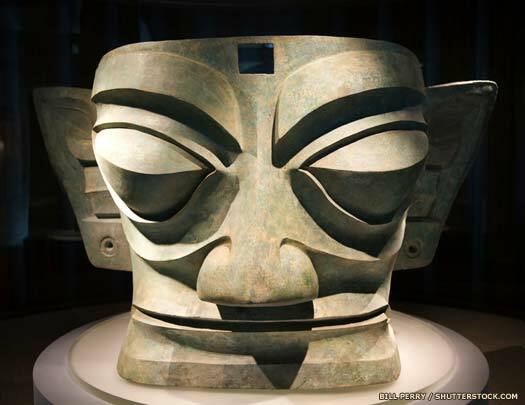 Then, around AD 2000, archaeologists found the remains of another ancient city, one called Jinsha, again near Chengdu. Although the Jinsha site contained none of the impressive bronzes of Sanxingdui, it did yield up a gold crown with an engraved motif of fish, arrows, and birds that was very similar to a golden staff found at Sanxingdui. This led some scholars to believe that the people from Sanxingdui may have relocated to Jinsha. The reason for the move was another mystery though. In 2014 a study by river science researchers at Tsinghua University in Chengdu came to the conclusion that the culture had ended due to the effects of a massive earthquake shortly after 1000 BC. The catastrophe, it is theorised, may have dammed the river high up in the mountains, long before it reached the city. A long stretch of the Yanmen Ravine through which the river now flows, high up in the mountains, is missing the normal signs here of glacial erosion, suggesting that these signs were wiped out by the earthquake and subsequent rock fall. The water would have diverted here, finding a new route, one which took it well away from the city and thereby reduced the available water supply. More recently, the Sanxingdui culture has been linked to the ancient kingdom of Shu (from which comes the modern Sichuan name). This little-recorded kingdom was also centred on the Sichuan Basin, and was not considered to be part of China 'proper' until its conquest by the Qin in 316 BC, during the 'Warring States' period. The Sanxingdui civilisation arises on the western edges of early Chinese culture at an unknown point in time, and possibly dating as far back as 3000 BC in terms of the origins of its main settlement. Archaeological finds give an estimated date for the transition from settlement to city of around 1600 BC. This is calculated to be during the reign of Xiao Jia of the Yellow River's Shang dynasty. Its people create an impressive city on the banks of the Minjiang River, which probably replaces older, less impressive dwellings. The city is soon walled, suggesting that it requires protection, although from whom is not known (the protection may actually be against the river itself, as the later city of Jinsha builds a wall for that purpose some eight hundred years later). It sits on a large floodplain in a valley, and the river cuts seven kilometres (4.3 miles) of high terraced walls that serve to prove to later archaeologists that a powerful river does in fact flow through this site at this time. An earthquake is recorded by the Zhou dynasty, striking the capital in Shaanxi province. The earthquake's epicentre is not recorded, but it could be farther to the west, possibly closer to the Sanxingdui culture. The people of this culture have not yet developed writing of their own, and are too far removed from Shaanxi province for it to have reached them, so their opinion on the matter is not recorded. An earthquake recorded shortly after 1000 BC by the Zhou dynasty may be the culprit behind the mysterious disappearance of the Sanxingdui civilisation. Geological evidence supports this, although it is unable to narrow down the time span to anything better than between 1330-200 BC. The massive temblor may cause catastrophic landslides, damming up the Sanxingdui culture's main water source and forcing it to divert onto an avoiding route. The new route is not at all close to the city so, faced with vastly diminished water resources, the people of the Sanxingdui effectively pack up and move closer to the new river flow, abandoning their previous dwellings. Before leaving they destroy their entire culture, burying it in two large pits. Then they migrate to find the river's new course. Presumably it is they who build the city of Jinsha when they do. Strangely, they do not revive their culture here, perhaps perceiving it as something that must remain dead along with their old city. Instead they develop the similar Jinsha culture which lasts a further five hundred years and then merge with the state of Ba or that of Shu later in the first millennium BC.